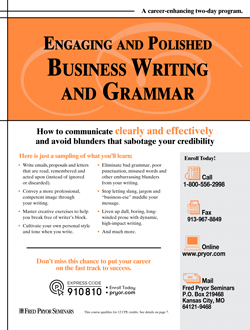 How to communicate clearly and effectively and avoid blunders that sabotage your credibility. Give your writing style a complete makeover in just two days! Your writing style speaks volumes about who you are. Crisp, clear mistake-proof business documents reveal a powerful, take-charge professional who's going places, fast! On the other hand, slipshod errors, dull, dry prose and grammar gaffes give the impression of someone who is sloppy, careless and not to be trusted with important assignments. If you want to shore up your writing skills and make sure others see you as a confident, capable communicator, this dynamic business writing class is not to be missed! It's challenging, lively and so entertaining, you'll be amazed at how fast the time flies. Rest assured, this program is in NO WAY like that elementary school grammar period you snoozed through way back when! We've made sure the content of this training workshop is fun, fast-paced, high-energy and reflects the latest research into adult learning techniques. How your personality affects your written communication style - are you Visual? Auditory? Kinesthetic? A combination? Writer’s block got you stalled out? Five idea- generating methods to jump-start your brain! Patterns of order - what are they? How do you know which is best for your document? Why you should use "nickel" words, but avoid "quarters"
The power of persuasive language throughout your written document - get others to "see things your way"
Topical and special paragraphs - what’s the difference? How to write a powerful closing paragraph that’ll knock ’em dead! The most commonly misused words in business writing - which are you guilty of using?